(May 2009)  When Asa Crane migrated to this area, he scouted for the perfect spot to make a home and landed, literally, on the Milton-Madison Bridge across the Ohio River. Asa and his partner are Peregrine Falcons, a rare species that at one point was on the federal Endangered Species List. 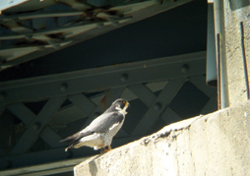 Since 2003, the pair has made their nest on the bridge. Recently, when geotechnical crews from the Kentucky Transportation Cabinet were testing the bridge piers for a possible superstructure replacement, they carefully maneuvered around the birds in an effort to not disturb them. Powerful and fast-flying, the Peregrine Falcon, about the size of a large crow, hunts medium-sized birds, dropping down on them from high above in a spectacular stoop. Virtually exterminated from eastern North America by pesticide poisoning in the middle 20th century, restoration efforts have made it a regular, if still uncommon sight in many large cities. Technicians working on the bridge found the nest in the same spot it has been in every year since the birds perched there. This year, Heyden set up a box for them on a pier, and they moved right into it. She said technically, the birds live in Kentucky and are among only eight known pairs in the entire state. Indiana has several more pairs of nesting falcons than that. The falcon couple is currently incubating several eggs. The fledgling birds will stick around the nest until July or August and then be totally on their own. Repairs to the bridge are slated to begin sometime after the fledglings fly the coop. Volunteers in the community keep a watchful eye on the family for wildlife officials. Although Asa Crane and his mate have been in the area for several years and have had two to four fledglings make it each year, no known offspring of the couple have set up their own nests in the area. Davis said it is because, while Clifty Falls State Park has the appropriate landscape, one of the major predators of the falcons, the Great Horned Owl, is common throughout the area. 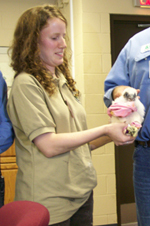 There are Great Horned Owls known to live in the park.